Review: A teenage girl gradually starts developing fits and comes down with a bizarre behavior. The mother seeks advice from two priests to help her daughter. She is possessed by a malicious person. One of the best horror films ever made. No one under 18 though should see this film it is so scary. Everything about this film is amazing. The directing, acting and screenplay etc all fantastic. This film is based on a novel by William Peter Blatty. The scenes in the bedroom had to be refrigerated in order to get an icy breath. The temperature of the room was around 30-40 below zero. John Boorman was offered the chance to direct but declined. It wasn’t until 1999 that the BBFC gave it a classification. At the Academy Awards in 1974 this won 2 Oscars. They were for Best Writing, Screenplay Based on Material from Another Medium and for Best Sound. At the Golden Globe Awards that same year it did much better and got 4 Awards. The Awards were Best Motion Picture – Drama, Best Supporting Actress – Motion Picture, Best Screenplay – Motion Picture and Best Director – Motion Picture. This is on Barry Norman’s list of 100 Greatest Films of all time that he produced at the start of 2012. 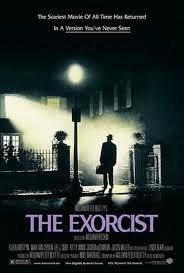 One film critic wrote “If movies are, among other things, opportunities for escapism, then The Exorcist is one of the most powerful ever made”.